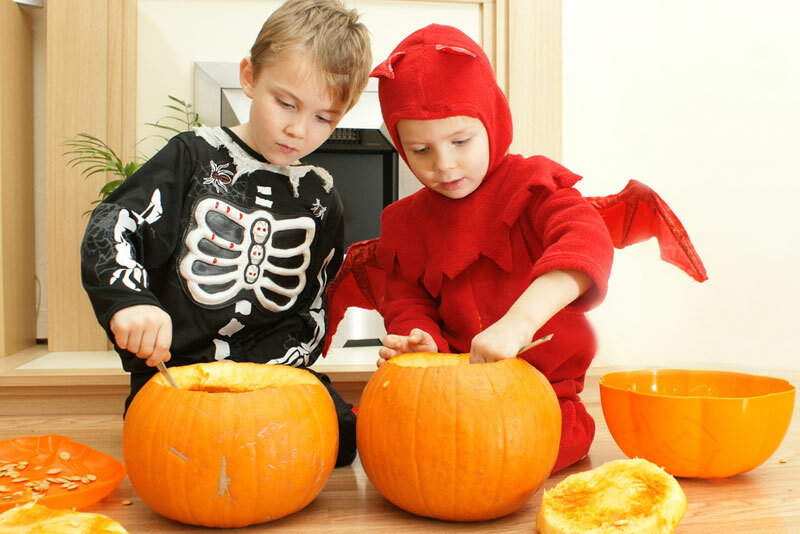 Are you throwing a Halloween bash tonight or hosting a neighborhood get-together? Bring on the yummy party snacks! We're here to help you whip up some last minute treats that are healthy and fun -- because having a Halloween party or potluck doesn't have to mean bowls full of candy or plates of spaghetti worms or grape eyes. Our 6 Halloween party snack and finger food ideas can be thrown together quickly, and each one definitely captures the spirit of Halloween. 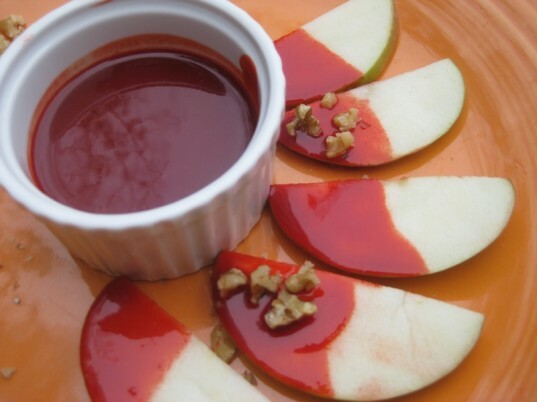 These party snacks include healthier versions of traditional foods like caramel apples, as well as more unique holiday foods like spooky smoothies in fun colors, pumpkin donuts, and even silly "ghosts" made with cheese, bread, and olives. With a little creativity, you can delight all of your guests or just your family members. These 6 treats take hardly any time to prepare and they boast lots of visual effect. Happy, healthy snacking and Happy green Halloween! We actually prefer these as a fun Halloween breakfast, but these smoothies can easily be served (especially in small glasses) at a party. 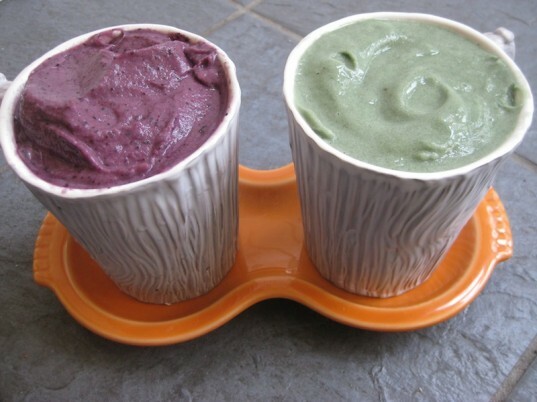 The purple color is achieved by blending berries into the smoothie and the pale green color is the result of a banana-spirulina combination. Both smoothies will delight kids, and the healthful ingredients will appease parents who want to make sure their children get some nutritious foods in during the course of the day! Playing around with using the traditional black and orange colors of Halloween in food is a fun way to plan your party menu. We used blue corn tortillas to approximate black and paired them with a vegan cheddar cheese for easy to pick-up quesadillas. 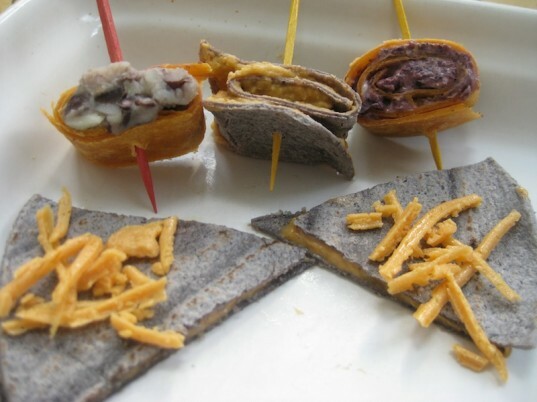 We also made roll-ups using the blue corn tortillas and hummus. The orange, chili-pepper flavored tortillas paired well with a black olive and cream cheese spread we whipped up in the food processor and also with some mashed black beans and potatoes. Black bean hummus is a natural pick too. This playful take on cheesy bread couldn’t be easier. Simply cut a baguette in slices and place on a cookie sheet or oven-safe tray. Cover the pieces with large, thin slices of cheese like Daiya’s jack-style cheese. Heat under a broiler for a few minutes until the cheese melts. 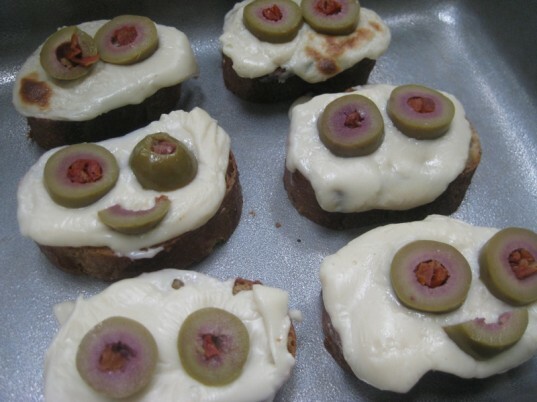 Slice some stuffed olives for eyes. Remove the bread from the oven and place the olive eyes on. Serve warm. The ingredients inside real caramel apples are a little scary themselves-think high fructose corn syrup and red dyes (not to mention the super-sticky, teeth-pulling texture). We made a vegan caramel sauce from The Voluptuous Vegan that uses more natural sweeteners like maple syrup and brown rice syrup instead and then added some natural food coloring to make it a bloody red. Serve the slices with some chopped nuts and dip away! After a few chilly hours trekking around the neighborhood trick-or-treating, kids could use a warming pick-me-up. 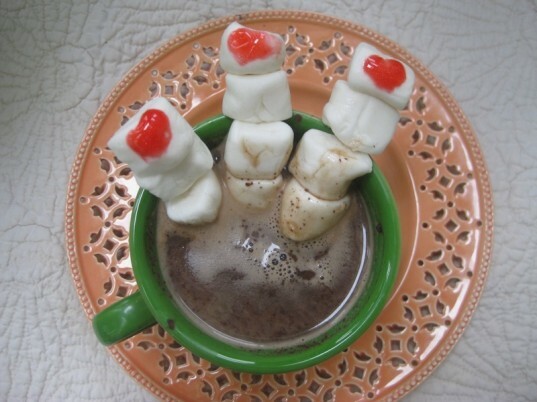 Take your favorite hot chocolate recipe (ours is from The Kind Diet), and add some marshmallow mummy fingers to it. We stuck four Dandies vegan marshmallows on a toothpick (you could also use a coffee stirrer or a thin straw for littler ones) and used some leftover red decorating gel to paint fingernails. You could also mix up a little powdered sugar and water with food coloring to make the fingernails-green would be fun! Super quick and guaranteed to get a smile! 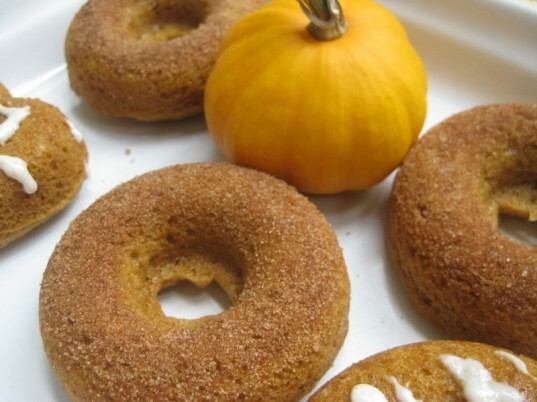 Gluten-free pumpkin donuts may not be traditional Halloween party fare, but they would be a welcome addition to any fall holiday occasion! If you want to make the donuts even more festive for the holiday, consider tinting the cream cheese drizzle orange or using orange or black-colored sugar. This playful take on cheesy bread couldn't be easier. Simply cut a baguette in slices and place on a cookie sheet or oven-safe tray. Cover the pieces with large, thin slices of cheese like Daiya's jack-style cheese. Heat under a broiler for a few minutes until the cheese melts. Slice some stuffed olives for eyes. Remove the bread from the oven and place the olive eyes on. Serve warm.